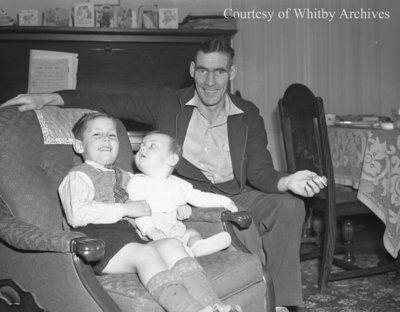 A black and white large format negative of Robert Wagstaff and his two children. In this view a young male child is sitting in a chair with his arm around a baby who is looking up at him. Mr. Wagstaff is sitting to the right of the children. Robert Wagstaff and Family, December 7, 1947, Marjorie Ruddy. Whitby Archives A2013_040_455.